Reverberation time : up to 20s. Density control (from Flat to Extreme). Reverb plugins are an excellent mixing tool as well as a individual effect. I love to use them in my studio. 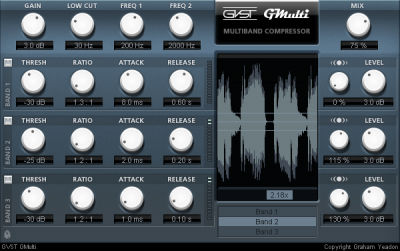 Glaceverb is one of my go to plugins, I use this on auxilary sends and on snare drums, electric guitars and vocals. It also uses very little CPU power which I find with other reverbs like Ambience tend to be very CPU hungry. If you have an older PC or laptop system this reverb provides great sounds without impacting DAW playback performance. The controls on Glace are extensive for such a small plugin. The RVM algorithm calculates, deformations, vibrations and the acoustic response of surfaces alowing you massive options for tweaking. The residual vector (RVM) on the left hand side is something different with some out of the ordinary controls. The modulation slider controls pitch modulation, it’s not extreme modulation which is nice. The RVM rate, RVM Amount, Energy and Resonance seem to be subtle and office some variation on what reverb you have setup. Resonance also add’s more bottom end and resonates lower frequencies. Under the Surface control n the right is where most of the changes I make are made. The absorption works well in simulating a room with less reflections when set low. Density is very sensitive and can add a lot of intensity to the reverb in general it can however really drown your sound. My favourite control is width, it allows you to increase the stereo field even of a mono track and sound’s amazing. This is a great reverb for adding ambient spaces for instruments. Sounds can get real wacky with the amount of controls and range on these controls. I always opt for normal reverbs but you can go crazy with GlaceVerb. To let you here it in action, I’ve uploaded an audio example of a dry guitar track with no reverb and then the same track treated with GlaceVerb. Excellent multi-purpose reverb for any instrument or even an entire mix. Good amount of presets and sounds available. Low CPU hit and fun to play with. Studio Blog – Free VST Effects. I’m an avid fan of freeware and donation based software. Check out some of these awesome plugins to help you get started in mixing and mastering audio. Density mkII was primarily designed to work in a typical stereo audio group mixing situation or for summing and to glue all things together in an unobtrusive way. The BootEQ mkII is an equalizer and pre-amp simulator combination which provides some nice and musical signal coloration effects. 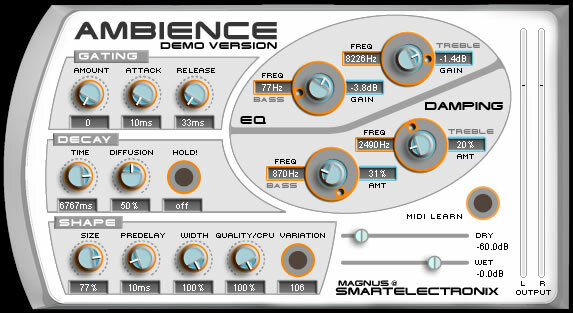 Ambience is a reverb that rivals the quality of the best commercial reverbs. GMax is a maximizing limiter. The most common usage is to boost the perceived level of a signal by increasing base amplitude while preventing clipping. It works by first increasing the level of the incoming audio by a given amount. Then, any audio that becomes too loud is “turned back down”, ensuring that the level never exceeds the “ceiling” level. While a maximizing limiter is often used to make an entire song seem “louder”, it may also be used in place of a compressor to help control individual tracks. The gain reduction meter shows when the limiter is affecting the signal. You should listen carefully to these sections to make sure that you are not pushing the signal too hard (or maybe to make sure that you’re pushing it hard enough!). When maximizing a mix, it’s a good idea to leave a little headroom. Some audio equipment doesn’t cope well with signals that reach the maximum peak level of 0 dB. Setting the ceiling a little lower – at around -0.3 dB, for instance – is a good starting point.